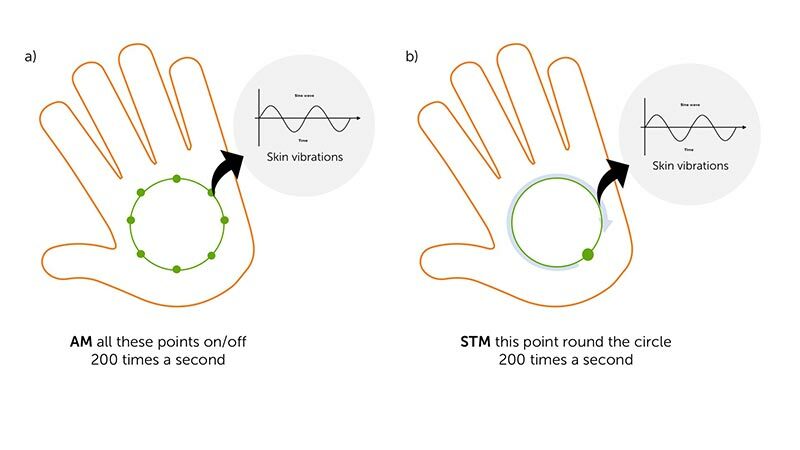 Dr. Orestis Georgiou, Director of Research, writes about how Ultrahaptics’ new spatiotemporal modulation technique enables the creation of increasingly complex tactile effects in mid-air. 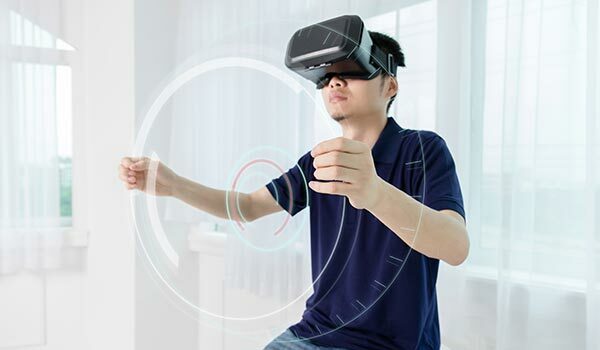 Ultrahaptics’ core mid-air haptic technology uses ultrasound (i.e. frequencies beyond the range of human hearing) to project tactile sensations directly onto a user’s hands. No gloves or handheld controllers are needed. Normal ultrasound is not only beyond the range of human hearing, but also beyond the range of human tactile perception. The trick with Ultrahaptics’ haptic technology is the way that it modulates ultrasound waves to create perceptible tactile sensations in mid-air. Not all modulations, however, are equal. The new spatiotemporal modulation technique we’ve recently introduced takes our haptic technology to the next level, making it possible to render increasingly complex shapes and other effects in mid-air. Ultrahaptics’ original haptic technology modulated ultrasound waves by switching them off and then on again very quickly (at a frequency between approximately 40Hz and 400Hz, i.e. between 40 and 400 times a second). Vibration-sensitive touch receptors in users’ hands could detect this on-off switching and interpreted it as tactile sensations. This method, called amplitude modulation (or AM), is very effective in creating tactile sensations and works well for simpler applications. However, it can only create discrete focal points of sensation. This makes it difficult to render smooth curves and lines. Projecting ultrasound onto an oil bath allows you to ‘see’ the shapes created by Ultrahaptics’ haptic technology. Here you can see the discrete focal points created by amplitude modulation. However, Ultrahaptics’ most recent haptic technology (which can be found in our new STRATOS Explore development kit) uses a different technique to modulate the ultrasound waves. The main idea is simple: instead of turning the ultrasound on and off, move focal points away from the user’s hand and back again at a frequency that is perceptible by touch receptors. Hence the name spatiotemporal modulation (or STM) – the ultrasonic waves are modulated both in space and time. In the same way as touch receptors in users’ hands can detect the on-off switching of ultrasound waves, they can detect the change in sound pressure as the focal point moves away from and back towards their hand. Mid-air haptic technology using STM is not limited to discrete focal points. Instead, lines and curves can be repeated almost continuously. These can then be used as a basis to render virtual objects and shapes, which enable a whole new spectrum of high fidelity applications in augmented and virtual reality. Spatiotemporal modulation enables you to render shapes. Ultrahaptics have also developed and patented algorithms that realize the required ultrasonic waves and modulations using relatively little computing power. This enables our haptic technology to run on readily accessible hardware. If you’re interested in exploring how being able to create complex tactile effects in mid-air could transform your business, or in joining our Academic Program to conduct ground-breaking research into mid-air haptics, then contact us here. T. Iwamoto, M. Tatezono and H. Shinoda, “Non-contact Method for Producing Tactile Sensation Using Airborne Ultrasound,” EuroHaptics, LNCS 5024, 504-513, 2008. T. Carter, S.A. Seah, B.Long, B. Drinkwater, S. Subramanian, Ultrahaptics: Multi-Point Mid-Air Haptic Feedback for Touch Surfaces, Proceedings of the 26th annual ACM symposium on User interface software and technology. (UIST ’13), New York, NY, USA, 8–11 October (2013). Kappus, Brian, and Long, Ben. “Spatiotemporal modulation for mid-air haptic feedback from an ultrasonic phased array.” The Journal of the Acoustical Society of America 143.3 (2018): 1836-1836.